The first: when I move H to 1, it become`s zero. Ok, I know HSV is circle and it is the same. But still not useful. CW or CCW modes have correct behavior, because it is impossible to say where 1 from 1, left or right. For now the solution is set 0.999 on the left color node manually. 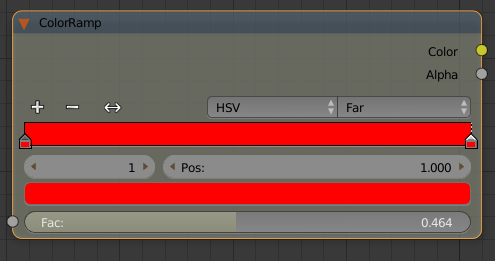 idk, may be it is not a bug of Blender, but misunderstanding of Far-mode. 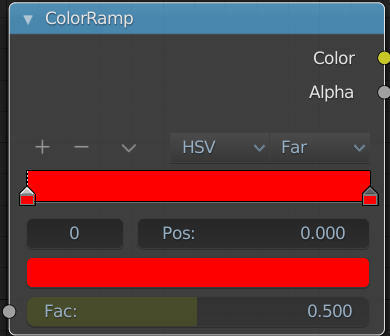 D4556: Fix T49979: HSV/HSL 'Far' interpolation in colorbands when both stops have same hue. Bastien Montagne (mont29) added a project: User Interface. 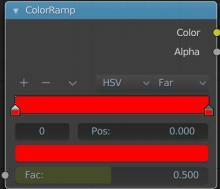 This is partly a limitation of how colours are picked and stored in Blender as RGB values. This means that when selecting a red with a Hue of 0 or 1 it is converted to the same RGB value which is what is stored, The hue value used in the ramp is determined from an RGB to HSL/V conversion. 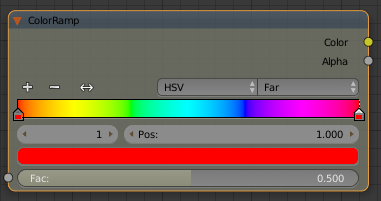 A potential fix for this would mean adding the ability to store Hue values when selecting colours which would result in the correct interpolation. The following patch changes the behaviour of the FAR mode to force interpolation if the hues are the same. The direction is set to CW in this case. This also means that you wouldn't be able to set an area of the same colour. Still the same problem. Far is not far-around. Thanks for the patch, added a review about that change (and fixed original patch that had some issues in some cases, e.g. with two stops on red and blue, would generate 1.6666 turn into the hue space ;) ). Bastien Montagne (mont29) added a commit: rB2691dd28e7dc: Fix T49979: HSV/HSL 'Far' interpolation in colorbands when both stops have same….